Summon your Shogunyan minion. This legendary warrior's armor smells faintly of tuna. 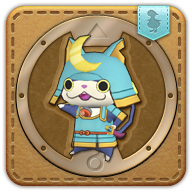 This Yo-kai is Jibanyan's legendary warrior ancestor. He just loves skipjack tuna and carries it around in his armor.